During a recent dinner at the Wine Cask filled with surprising creativity and multicultural touchpoints, it was Chef Jeremy Van Kralingen’s first dish that really told the strongest story: a cross-section of octopus, doused with a jalapeño-pineapple relish and sprinkled with popcorn nibs that were seasoned Tajin-style, with salty chile and tangy lime. It was as delicious as it sounds, sweet and spicy and savory and seafood-y, each bite layered with textures from chewy to crunchy, paired expertly with a premier cru Champagne. But the message was more poignant than just taste. This was a dish inspired by the chef’s Hawaiian-Chinese-Mexican-Dutch roots, enhanced by suggestions from his Latino kitchen crew, and delivered with the sort of stylistic care and flawless cooking techniques that have long ruled the Wine Cask way. In July 2017, Ashkar bought out longtime co-owner Doug Margerum (whose family founded the enterprise in 1981) and co-owner/operator Mitchell Sjerven (who also runs bouchon on West Victoria Street); the two men stayed on board until September of last year. The trio originally teamed up to save the Wine Cask in 2009 after a series of controversial moves by then-owner Bernard Rosenson, who’d bought it from Margerum in 2007. 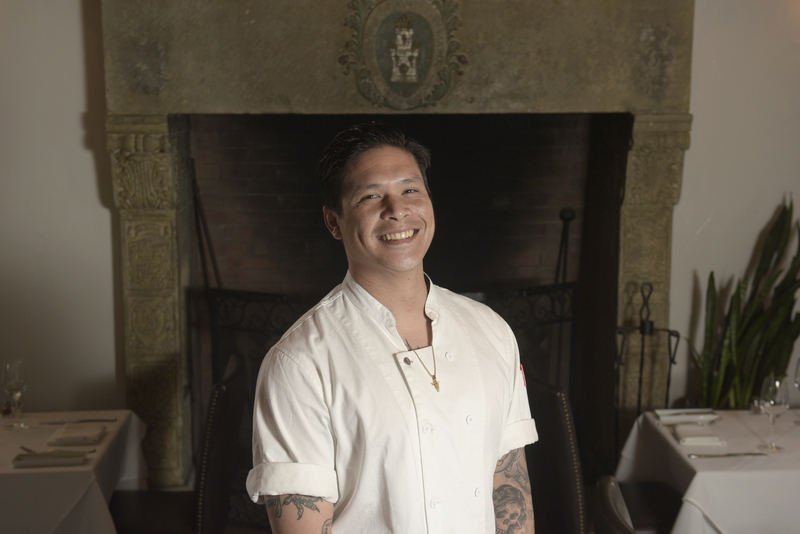 For the next nine years, with Sjerven overseeing day-to-day restaurant operations, the new owners repaired the restaurant’s reputation and returned it to the height of fine dining in Santa Barbara. That means Van Kralingen isn’t beholden to any particular style, so long as the results are good and, of course, work well with wine. Even the wine list is shifting a bit, according to our server Nuri Monahan, a well-known face in fine-dining circles. “We’re shifting the program to be more international than just Santa Barbara County,” said Monahan, explaining that they want to offer diners a counterpoint since Central Coast wines are “super well-represented” in town. “It’s been really well received,” said Monahan. But as the co-proprietor of the Santa Ynez Valley–based Point & Line wines, Monahan also proudly pours regional wines as well. That included a Santa Maria Valley chardonnay by Timbre that accompanied our seared scallops in corn-miso emulsion and a co-fermented red blend by Sanguis that enveloped bites of the pan-roasted ribeye. As Van Kralingen worked the kitchen on the night of my visit, Monahan guided my friend and me through the octopus, scallops, and ribeye as well as dishes centered on bone marrow, crab, and lobster. Most are not on the regular menu, which still features familiar classics like duck confit, pan-seared salmon, and braised pork shank. Among the on-point pairing displays, we enjoyed the oven-roasted marrow served with crab fat and sourdough toast, leveled by a citrusy Von Winning riesling from Pfalz, Austria. And while a curious choice at first, the Napa Valley sauvignon blanc by Spottswoode provided an herbaceous slice through the richness of the squid ink spaghetti, topped with lobster claw meat and swimming in preserved lemon-flavored crème fraîche. Since then, Van Kralingen worked at Café Luck, the San Ysidro Ranch, Julienne, El Encanto, and The Lark, before being hired by David Rosner about five years ago to join the Wine Cask team. Originally from Hilo, Hawai‘i, Van Kralingen originally came to Santa Barbara to attend SBCC and fell into the cooking life. That time in the kitchen makes him hypersensitive to what it’s like working the line, a mostly anonymous, often thankless task whether you’re in fancy kitchens or burger joints. “I feel like we’ve built a positive-reinforcement culture in the kitchen,” he said in an ever-so-slight Hawaiian accent. He’s challenging his cooks to come up with the next best dish and says they have dozens of ideas ready for prime time.